Mexico’s Pacific Treasure shines in both press and digital media such as The Happening, Milenio, Travel Report, Revista Nupcias and Alto Nivel, among others. The Riviera Nayarit doesn't miss a beat in different media both national and international, where there are articles dedicated to spreading the word on the destination, contributing to its positioning in the tourism industry. Not a day goes by without an article in one or more outlets, whether it’s highlighting the hotel infrastructure, the luxurious lifestyle, the vibrant coastal villages, the world-famous Playa del Amor or the incredible cuisine of the Riviera Nayarit. Some of the articles came about thanks to the work of the Public Relations office of the Riviera Nayarit Convention and Visitors Bureau and others were generated organically by the publications and agencies themselves. Just this month, The Happening, Milenio, Travel Report, Revista Nupcias, Alto Nivel, W Radio y and Volaris airline’s blog, among others, have all chosen to portray the best of the destination. Travel Report MX presented the “10 best all-inclusive hotels in Mexico,” where they mention the Iberostar Playa Mita and the Hard Rock Hotel Vallarta as an excellent option for relaxing and fun family vacations. They also highlighted the activities they can enjoy outside the resorts such as water sports, beach volleyball, bike rides and more. 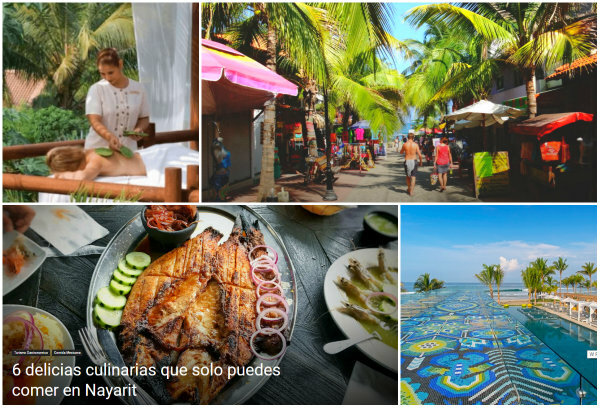 El Souvenir, a website specializing in travel and tourism destinations, published two articles: “6 Culinary Delights You Can Only Enjoy In Nayarit” and “Pacific Beaches In Mexico Where You Can Learn To Surf,” where they mentioned Sayulita, a Magical Town. Meanwhile, Milenio.com published in its “Tendencias” (Trends) section an article titled “Eat Well To Travel Better,” where it mentioned the Cuisine of the Sun and other great opportunities to enjoy the best eats in the Riviera Nayarit. The portal has 69 million page views and 11.2 million unique users per month.